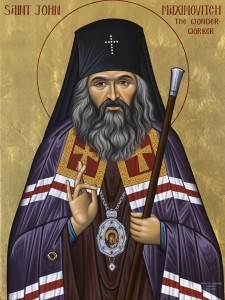 Hieromonk John was consecrated bishop on May 28, 1934, with Metrropolitan Anthony serving as principal consecrator, after which he was assigned to the Diocese of Shanghai. Twelve years later he was named Archbishop of China. Upon his arrival in Shanghai, Bishop John began working to restore unity among the various Orthodox nationalities. In time, he worked to build a large cathedral church that was dedicated to Surety of Sinners Icon to the Mother of God, with a bell tower and large parish house. Additionally, he inspired many activities: building of churches, hospitals, and orphanages among the Orthodox and Russians of Shanghai. He was intensely active, constantly praying and serving the daily cycle of services, while also visiting the sick with the Holy Gifts. He often would walk barefooted even in the coldest days. Yet to avoid the appearance of secular glory, he would pretend to act the fool. In 1951, Archbishop John was assigned to the Archdiocese of Western Europe with his cathedra in Paris. During his time there, he also served as archpastor of the Orthodox Church of France, whose restored Gallican liturgy he studied and then celebrated. 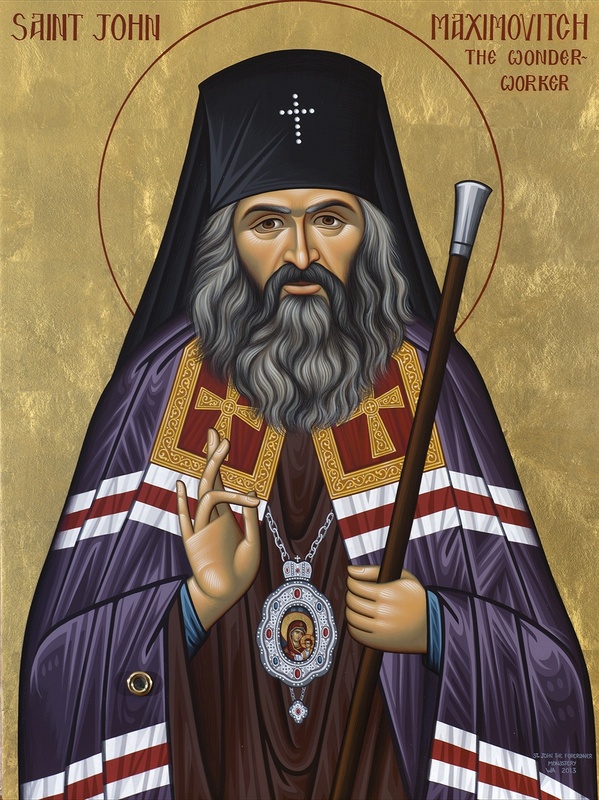 He was the principal consecrator of the Orthodox Church of France’s first modern bishop, Jean-Nectaire (Kovalevsky) of Saint-Denis, and ordained to the priesthood the man who would become its second bishop, Germain (Bertrand-Hardy) of Saint-Denis. In 1962, Archbishop John was assigned to the Diocese of San Francisco, succeeding his long time friend Archbishop Tikhon. Archbishop John’s days in San Francisco were to prove sorrowful as he attempted to heal the great disunity in his community. He was able to bring peace such that the new cathedral, dedicated to the Joy of all Who Sorrow Icon of the Mother of God, was completed.